The ethylene oxide market is expected to register a CAGR of 4.53 %, during the forecast period of 2019 – 2024. Major factors driving the market studied are the growing usage of PET in the food and beverage industry and increasing demand for household and personal care products in the developing nations. 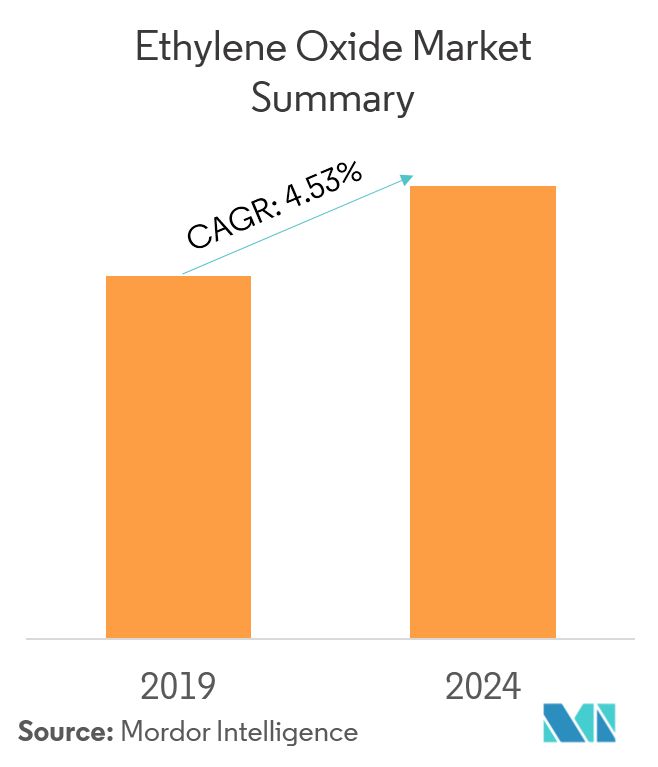 The harmful effects of ethylene oxide on humans and the stringent environmental regulations regarding the usage of ethylene oxide, are expected to hinder the growth of the market studied. The PET is majorly used in the packaging industry, primarily for packaging water, food, and alcoholic beverages. Some of the major properties of PET that make it suitable as a packaging material are recyclability, strength, and versatility, which are driving the demand for these products. Ethylene oxide derivatives find their uses in different applications in the household cleaners and personal care products. Ethyleneamines are used as building blocks to produce surfactants. A variety of 2-alkylimidazolines and their salts, prepared mainly from EDA, are reported to have good foaming properties. TEPA, ethoxylated with an average of 17 moles of ethylene oxide, improves the soil redeposition and clay soil removal properties of certain liquid laundry detergents. Asia-Pacific dominated the studied market across the world, with the largest consumption from the countries, such as China and India. Increasing awareness about the advantages of multi-functional surfactants is also expected to boost the demand for specialty surfactants, during the forecast period. According to L'Oreal annual report, the cosmetics market had increased at a rate of around 8%, from 2015 to 2017. 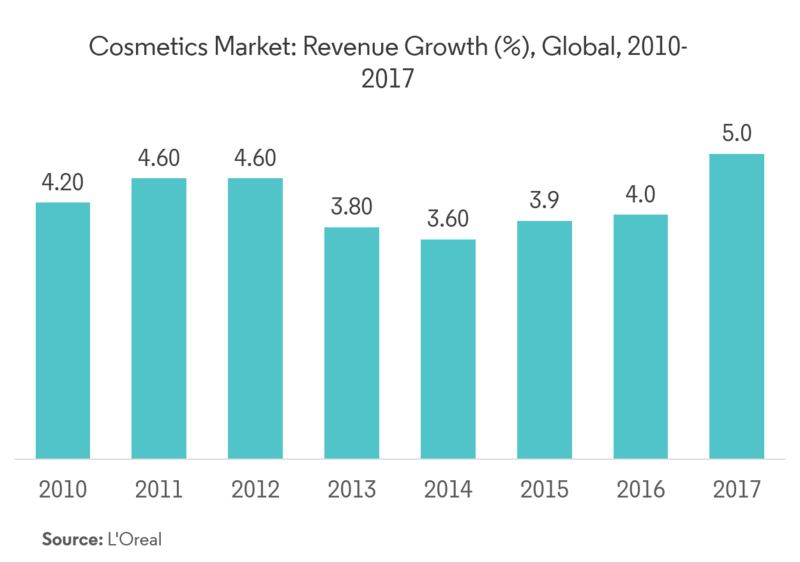 Asia-Pacific accounts for the largest share in the cosmetic market, with Americas and Europe holding the second- and third-largest shares, respectively. Asia-Pacific has become the largest consumer, as well as producer of surfactants. The production has reached very high levels, becoming a major hub for the exporting of cosmetics and personal care products to developed nations, like the United States. The demand for cosmetic products is also increasing rapidly, owing to the demand from markets, such as Japan and China. The personal care sector in Japan has witnessed a steady growth in the past five years, with the value reaching nearly USD 5,612 million in 2018. This is mainly due to the rapidly increasing demand for beauty care products, such as shampoos, soaps, and detergents, and increasing investments by domestic players in the personal care sector in Japan. 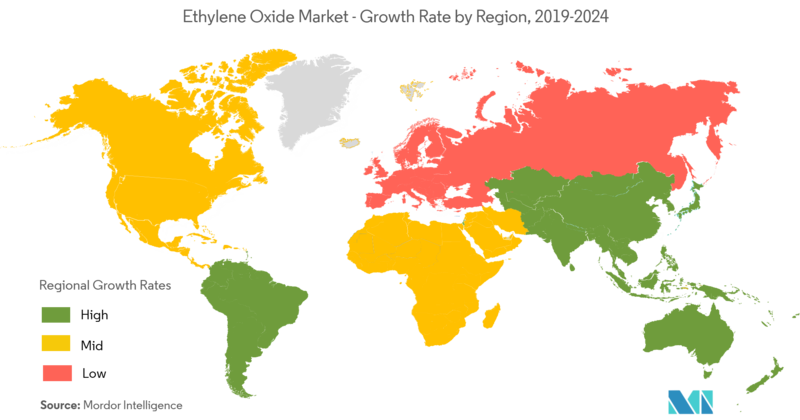 Asia-Pacific region dominated the global market share in 2018. China accounts for around 63% of consumption of ethylene oxide and its derivatives in Asia-Pacific region. China is the largest market in terms of production and consumption of ethylene oxide in the Asia-Pacific region. Ethylene oxide is used in the manufacture of ethylene glycol, which further has multiple applications in the automotive sector, such as additives in lubricants and fuels as anti-freezing agent, friction modifiers, and coolant. Additionally, acrylonitrile, a derivative of ethylene oxide, is used in manufacture of rubber, with multiple applications in automobiles, such as tires, insulation, and interiors. Ethylene oxide has a unique application in the manufacture of pesticides and insecticides in the agricultural sector. China has the highest agricultural output globally, through its 12.06% of total land for cultivation. The agricultural output of China experienced rise at a CAGR of 0.51% over 2013-2017, owing to the increased usage of crop saving chemicals. Ethylene oxide is used for sterilization of food products especially meat, to deactivate bacteria, enzymes, etc. increasing the shelf-life of food. Other poultry and dairy products also require sterilization before use. 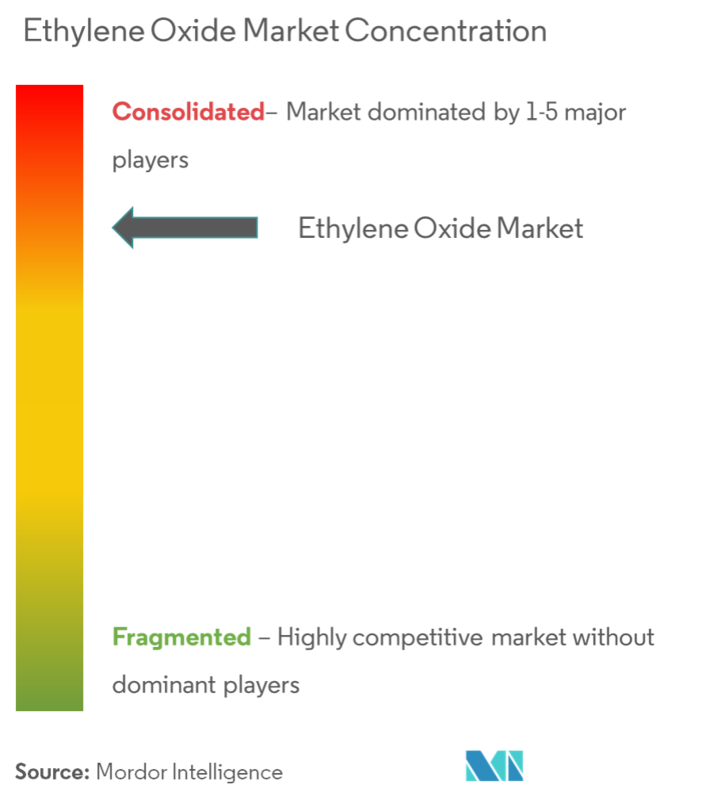 The ethylene oxide market is partially consolidated, with top 10 players accounting for more than 55% of the market. 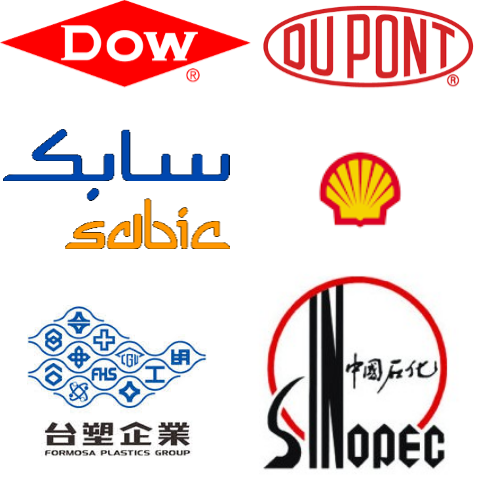 The major companies include DowDuPont Inc., Royal Dutch Shell PLC, Formosa, SABIC, BASF SE, and INEOS.